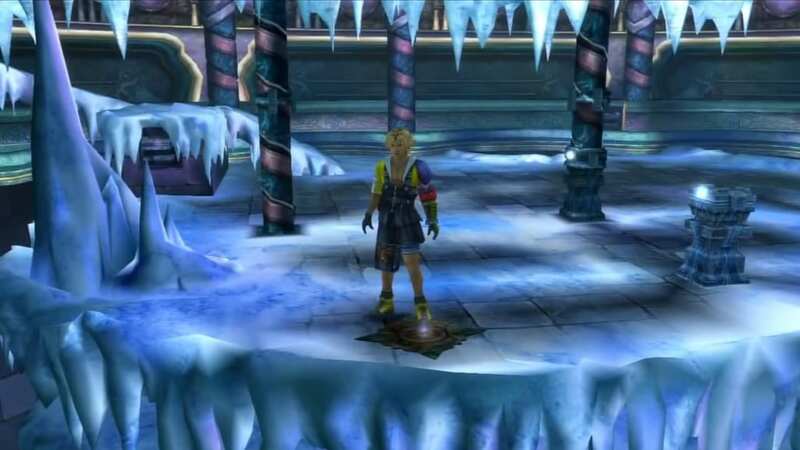 A guide on how to clear the Macalania Temple Cloister of Trials in Final Fantasy, including obtainable Aeons and treasures in the game. Proceed downward to the middle level. 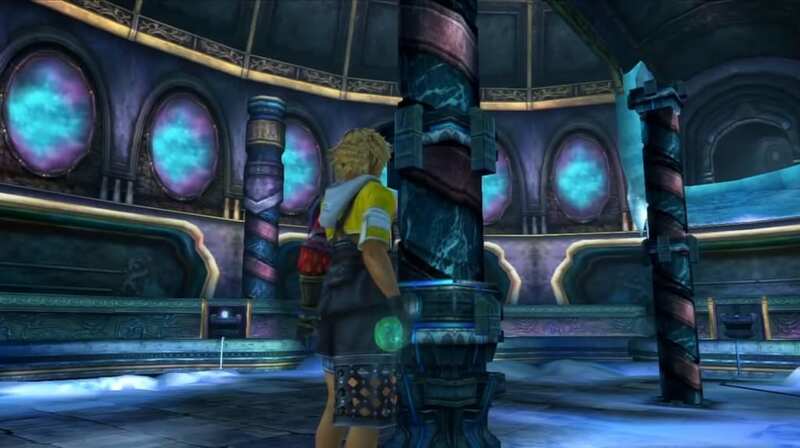 Remember that the Glyph Sphere is located inside a pillar. 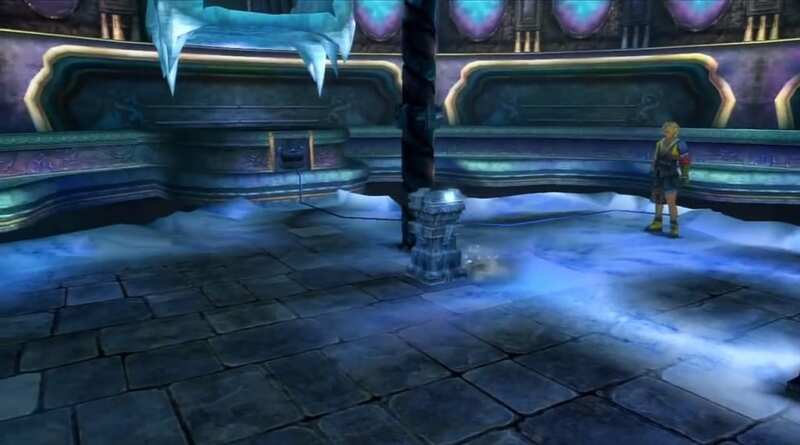 The Macalania Sphere #1 is located below the opposite side of the bridge while the Macalania Sphere #2 is located near the icicle that blocks that way to the bottom level. 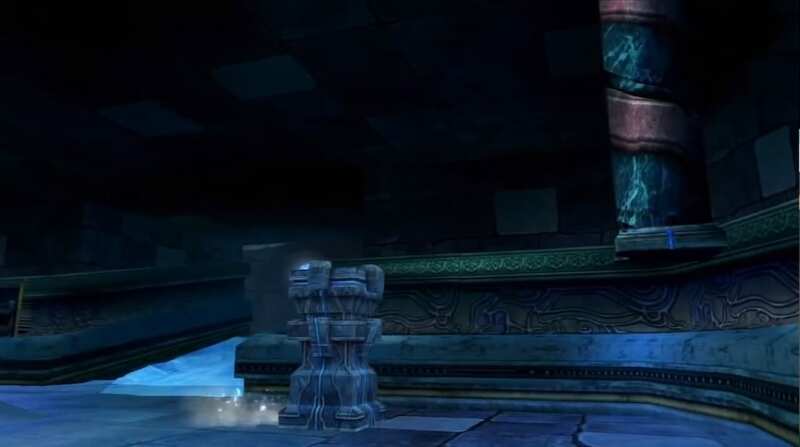 Move the pedestal with the Glyph Sphere to the east. The icicle along its path will disappear. Pick up the Macalania Sphere #1 on the rightmost corner recess of the middle level. 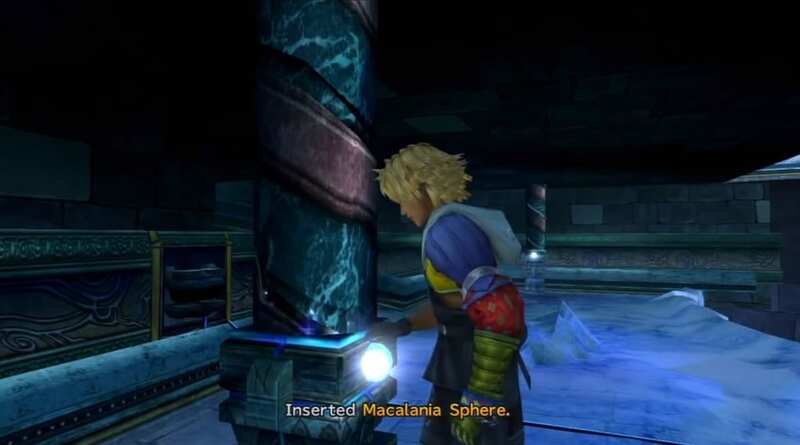 Place the first Macalania Sphere on the pedestal. Move the pedestal to the north. The icicle along its path will disappear. 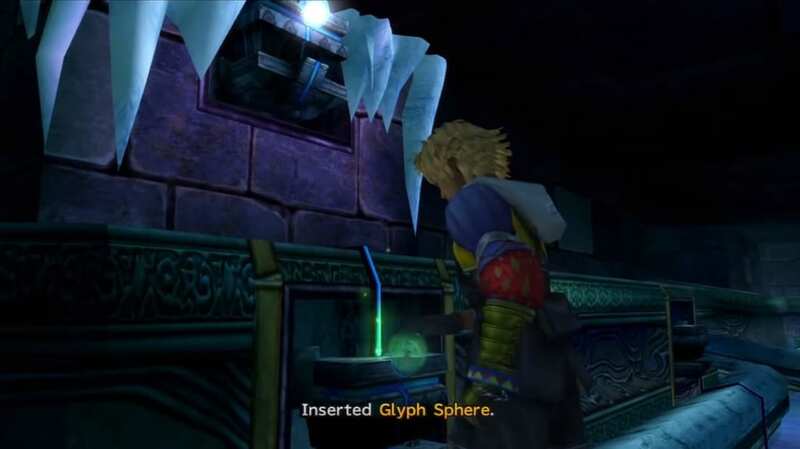 Pick up the Glyph Sphere from a pillar. Proceed down the ramp to the lower level. Place the Glyph Sphere in leftmost recess. A third Macalania Sphere will appear on the middle floor directly at the top of the inserted Glyph Sphere. 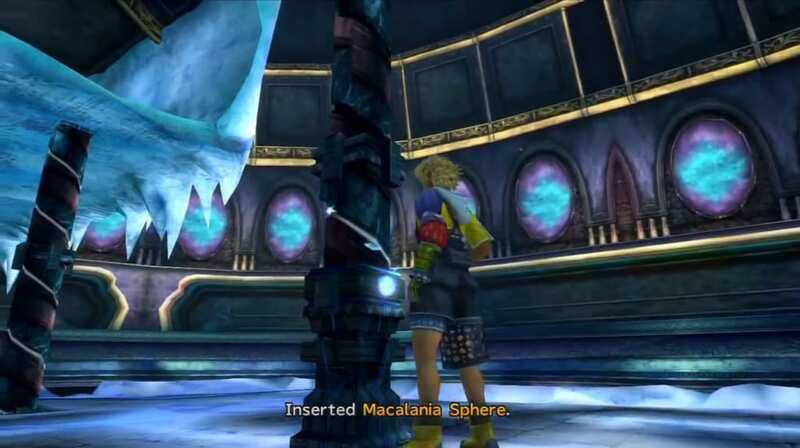 Push the Pedestal with Macalania Sphere #1 to the right side. 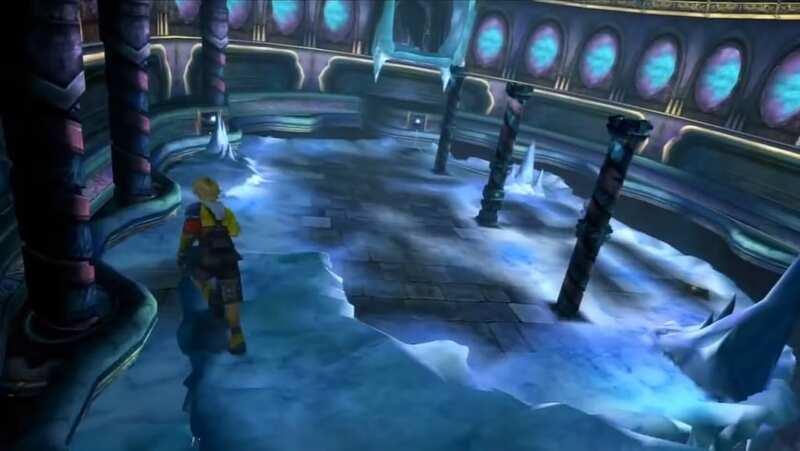 A portion of the ice bridge will appear. 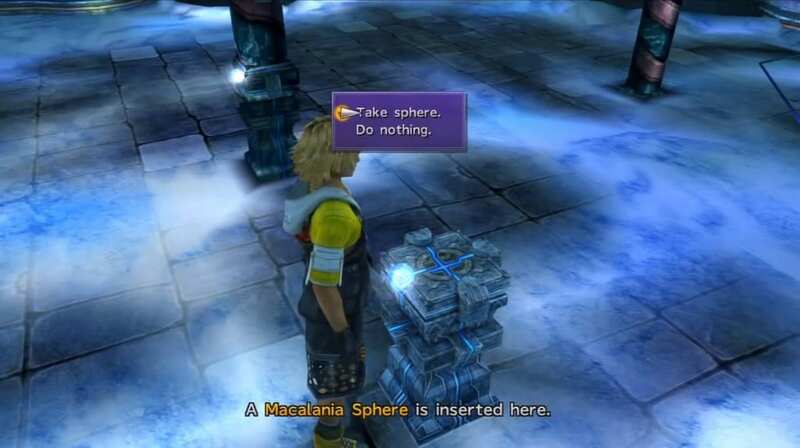 Pick up the Macalania Sphere #3 at the middle level. Place Macalania Sphere #3 inside a pillar at the bottom level. 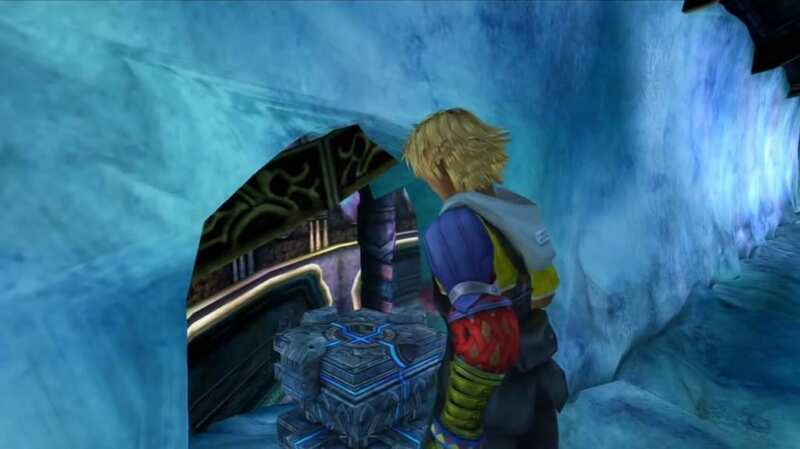 The pillar is located at the left side. Another portion of the ice bridge will appear. 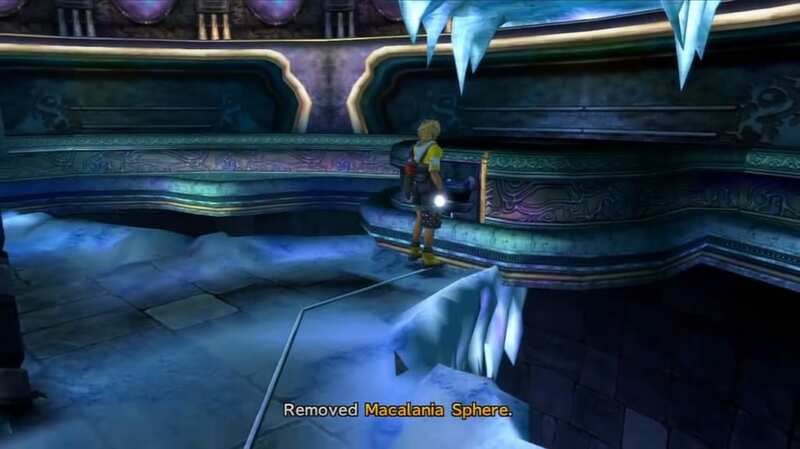 Remove Macalania Sphere #2. It is located near the ramp leading to the bottom area. Place the Macalania Sphere #2 inside the pillar located also in the middle level. 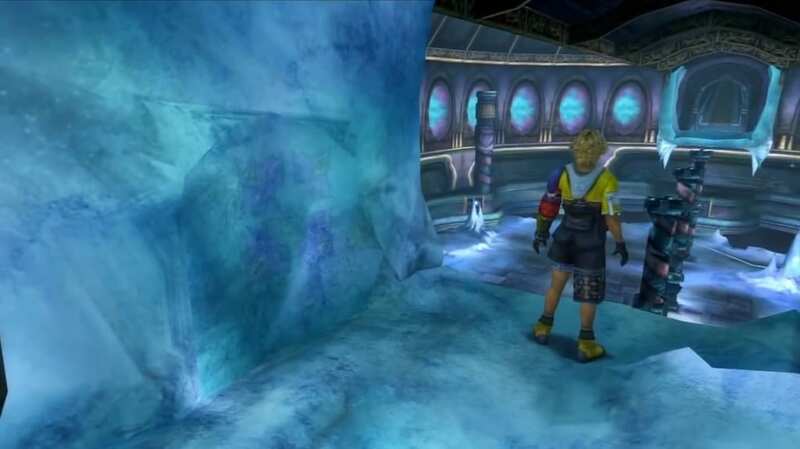 This is where you got the Glyph Sphere at the beginning. Another portion of the ice bridge will appear. 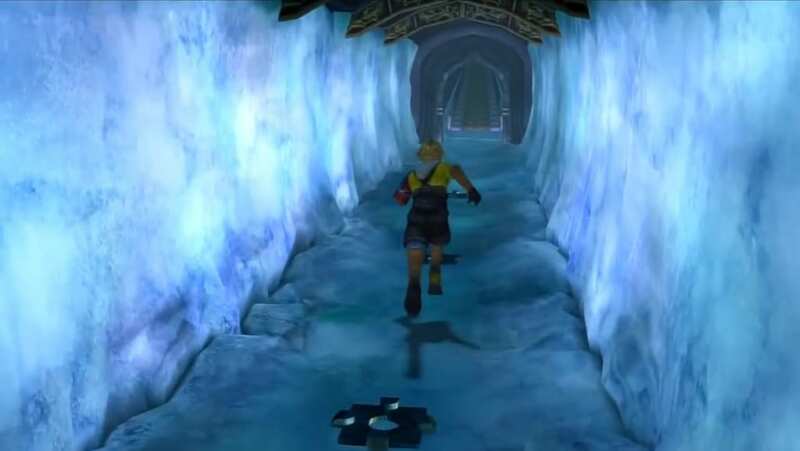 Go upward to the ice bridge. Step over the blinking mark and a new pedestal will appear. 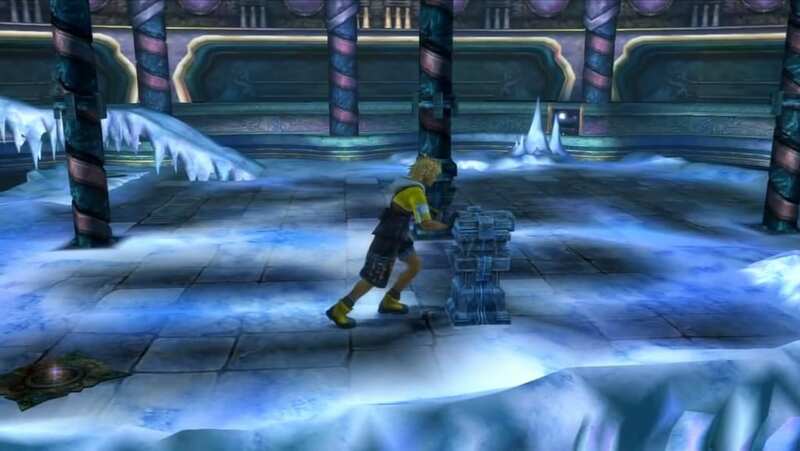 Pick up the Destruction Sphere and push the pedestal downward. 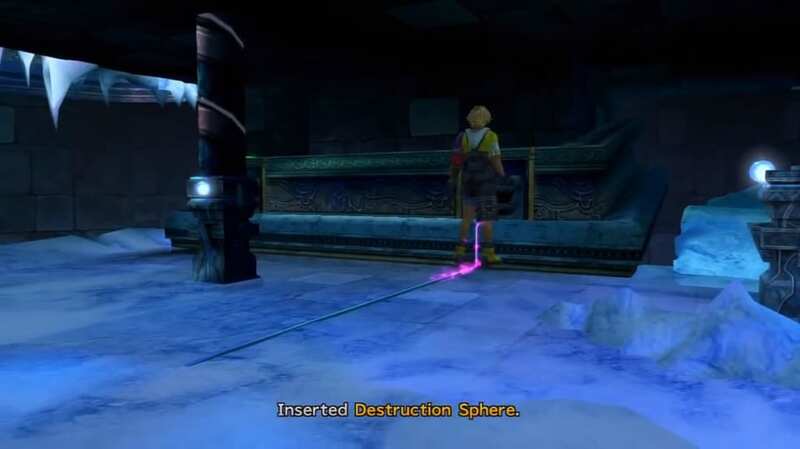 Place the Destruction Sphere temporarily at a vacant slot in the middle floor. Step over the blinking mark in the middle floor. The previous pedestal will appear together with the Macalania Sphere #2. 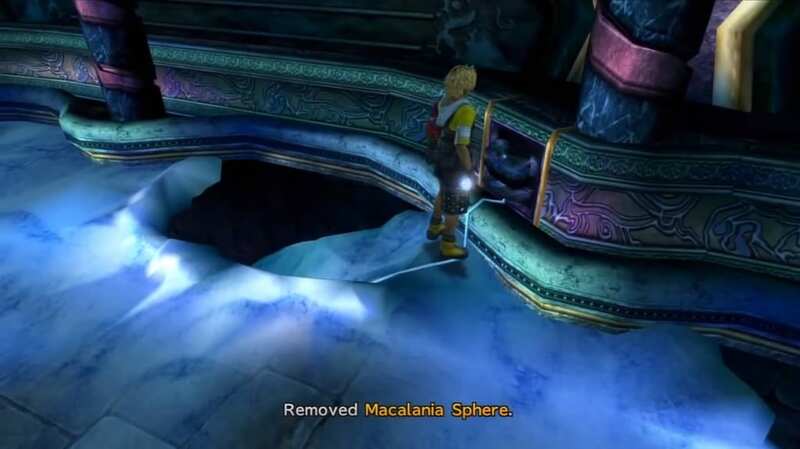 Take the Macalania Sphere #2 and place it back to its previous slot- the right corner recess. Repeat the same process of pushing the pedestal down to the bottom level. 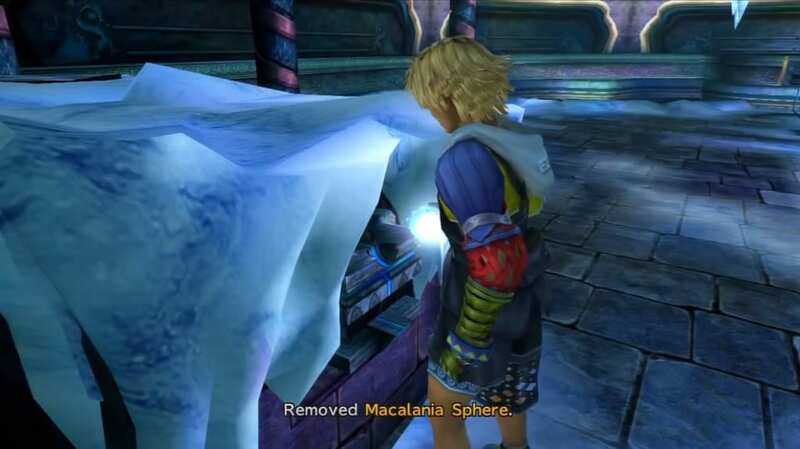 Pick up Macalania Sphere #3 from the middle-level pillar and place it back to the slot near the ice ramp. 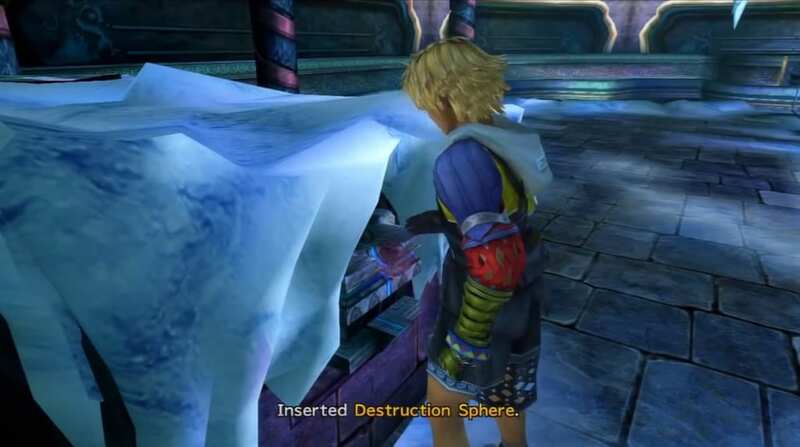 Pick up the Destruction Sphere from its current place. 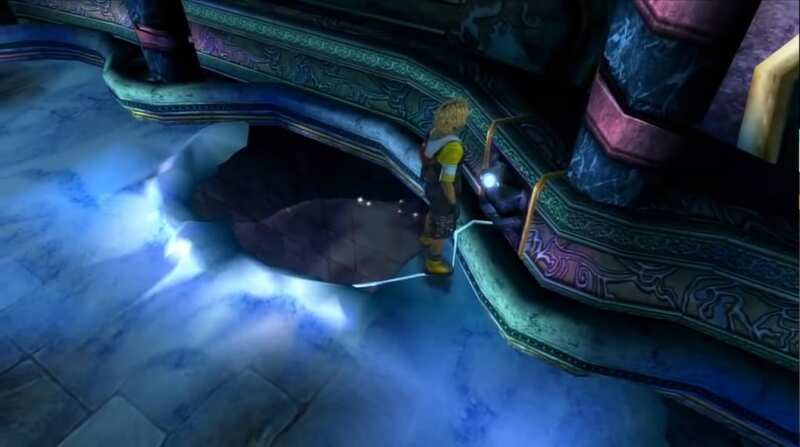 Go to the bottom level and place it on a recess beside the Glyph Sphere. 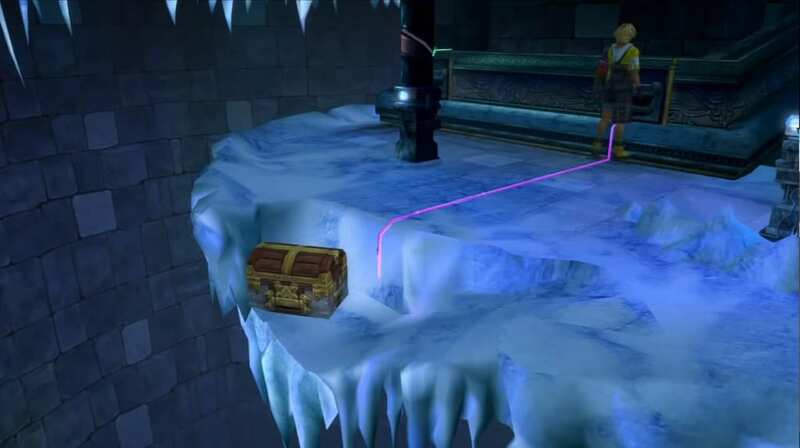 A hidden Treasure Chest will appear. Obtain a free Luck Sphere from the chest. Repeat the same process of pushing the pedestal Macalania Sphere #2 to the right. Also with Macalania Sphere #3 back to the pillar of the middle level. 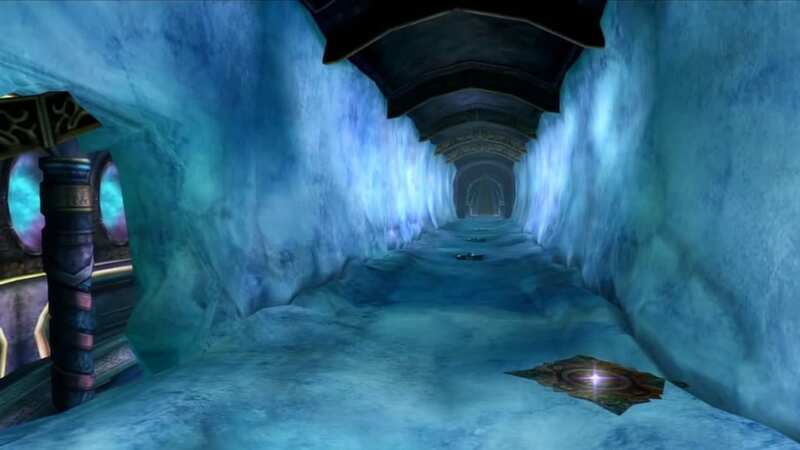 Go upward and cross the ice bridge leading you to the next room.